With Mahjongg Dimensions Deluxe, journey through a symphony of dimensions! 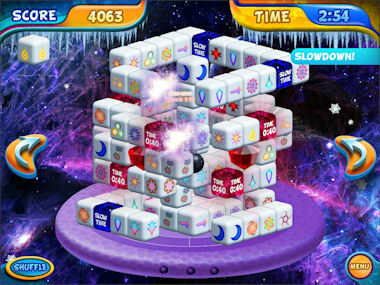 Reinventing the classic game of Mahjongg, Mahjongg Dimensions adds a 3D twist. Now you can enjoy this brand new deluxe version of the game, featuring gorgeous graphics, a sweeping orchestral soundtrack, and hours upon hours of addicting tile-matching gameplay! With tons of levels, multiple game modes and medals, Mahjongg Dimensions Deluxe is one game you do not want to miss. Untimed, Regular, And Expert Modes! Requires Windows XP or later, 1 GB Memory, 1.5 Ghz or better CPU, 256 MB Video RAM or 32-bit video card.